Choose a location that’s free from ambient noises like echoes, indoor, and outdoor noises. It would also help to be mindful of instances when participants themselves make the recording challenging to transcribe, as they form “sub-meetings” or side conversations during the discussion. Low-volume voices or whispers won’t seem like a threat to the recording, but it actually is, especially when many people are talking simultaneously which makes the main dialogue tough to understand. Allot a break time for your respondents to snack and drink when conducting lengthy discussions. Be it just chips, biscuits, or coffee – the sound of wrappers and glasses disrupt the quality of the discussion and audio. You probably know the size of your focus group beforehand. It is imperative to the quality of the recording to strategize seating arrangements the way the recorder catches everyone’s voices clearly. A small focus group with only 4-6 participants is the ideal volume as they can be closely positioned in a circle, usually with just a coffee table in the middle where the dictaphone is placed. For more than 6 participants, it is highly recommended to utilize boundary microphones evenly positioned on a boardroom table. Remember to be careful when moving your recorder while turned on as well. The sound of the mic being hit or bumped into things drown out people’s voices. Avoid using mobile phone recorders AT ALL COST, as these are specifically designed for close up recording only. Keep in mind that focus group transcriptions are highly dependent on the quality of your recording, so the type of recorder you use also plays a big role at ensuring high quality audio. It is difficult to label the names of large-scale focus group respondents, especially if some of them don’t speak up frequently. The voices may sound quite similar in the recording at times too! Get more accurate verbatim transcripts and easily avoid mislabeling by having respondents raise their hands before interjecting so you could call their names clearly for the recording. Avoid just letting them chime in the discussion anytime they want and instead conduct it with utmost coordination. You can also thank them by name after their dialogue to make it even clearer. 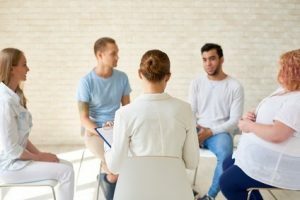 Poorly recorded focus groups are less likely to generate quality market research transcripts whether you transcribe it on your own or use any of the most expensive professional transcription services in the market. Get the best bang for the buck by properly recording your focus groups for useful, accurate transcripts perfect for analyzing insights and research findings. TranscriptionWing offers a high quality verbatim transcription service perfect for getting every bit of information out of focus groups. 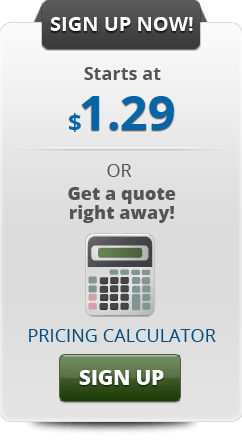 Learn about our affordable transcription pricing here, or give us a call at +1-203-413-2414 and we’d be delighted to be of assistance! Greenwich, CT USA, January 29, 2018. 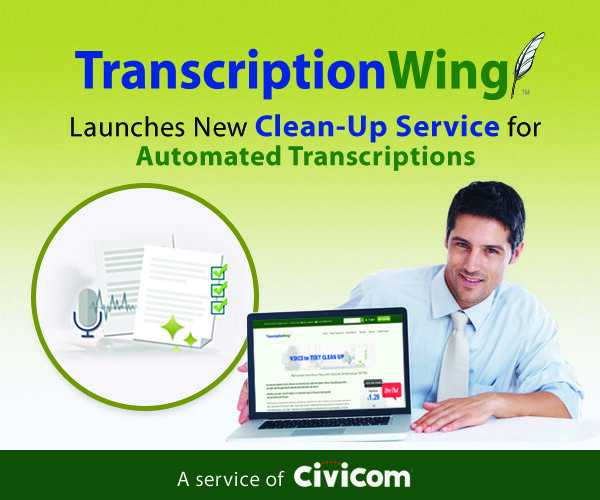 Civicom® transcribing service TranscriptionWing™ announces the addition of automated transcription clean-up to its general transcription service offerings. The new service caters to clients in need of reworking their machine-generated transcriptions into readable transcripts with higher accuracy. Today, the transcription industry has become inundated with many seemingly convenient automated transcription options. But these AI-powered voice-to-text services, while cheap and quick to produce, remain challenged in various aspects: regional accents, fast speakers, and multiple participants in overlapping conversations are indistinguishable to machine-run speech-to-text conversion processes, therefore producing subpar transcripts littered with mishears all throughout, and missing key content vital to the transcript as a whole. TranscriptionWing’s new clean-up service is an answer to this gap of quality that is critical to transcription clients: complete, accurate transcriptions that is still within their budget. With a promise of affordability, flexibility, and high accuracy, TranscriptionWing will proof the automatically generated transcripts and transform them into readable, workable transcripts fit for insight discovery, reports, or documentation. With an experienced team of in-house transcribers and editors working with the best client experience in mind, TranscriptionWing assures only the best quality with every request processed through the pipeline. Originally established to provide transcriptions complementing Civicom’s conferencing services, TranscriptionWing continues to serve affordable and accurate general transcriptions to various industry sectors including market research, technology, finance, as well as legal, educational, and religious institutions. TranscriptionWing™ specializes in general transcription services, providing accurate audio transcriptions at flexible turnaround options from four hours to five days at rates that are as low as $1.29 per recorded minute. TranscriptionWing operates in a culture of confidentiality that ensures project security and client information privacy. We have just launched a new and improved mobile-friendly login and upload page for ordering transcripts on our site! 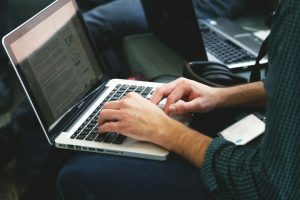 Visitors can now seamlessly upload recordings and request affordable transcripts on www.transcriptionwing.com starting at $1.29. Click or tap the Get Started button on the upper-right corner of the TranscriptionWing homepage. This will take you to the landing page where you can log in and upload your recordings. Log in using your TranscriptionWing credentials. Select the recordings you wish to upload for transcriptions. You can either drag and drop your media or select “click here to browse” if you are uploading a file from a local folder on your computer. You can also import from cloud storage options Dropbox, Google Drive, or simply paste an external link and we will take care of it for you. The files you’ve selected will be displayed alongside a drop-down menu with the exact date of delivery options and its corresponding cost. Select your turnaround preferences from economy (5 business day), regular (2 business day), one-day, 9-AM (next business morning), or rush delivery option (4-hours same day). If you wish to provide specific instructions for your transcripts, click or tap the Add Instruction button. You can upload supporting documents, input project details, and specify labeling, verbatim, and timestamp preferences. Make sure that the “Transcribe All” checkbox is ticked! Otherwise, your media will only be uploaded to your account and no transcript will be requested. You are now set to request for transcripts! Click “Upload” to start uploading. Congratulations! Your file has been uploaded and TranscriptionWing will be processing your transcriptions. To check on your requests, simply log into your account and the status of your transcripts will be displayed alongside the corresponding recording. Should you wish to confirm or make any changes, you can also contact the TranscriptionWing team via transcripts@civi.com or call 203-413-2414 and we’d be happy to help! Greenwich, CT USA, September 26, 2017. 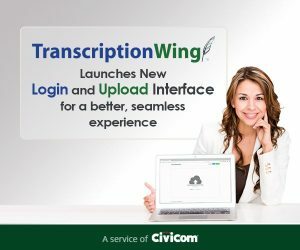 General transcribing service provider TranscriptionWing has just launched a new and improved login and upload page for its website, www.transcriptionwing.com, where new and existing clients can now seamlessly request affordable transcriptions. TranscriptionWing was established as a service to fill the need of Civicom’s conference call clients who were looking for quality audio transcriptions. It has since grown to serve virtually every industry including marketing research, legal, finance and educational institutions. TranscriptionWing has continually developed its processes over the years, unceasingly strengthening its new and existing relationships and improving its services with the best client experience in mind. With TranscriptionWing’s new login and upload portal, customers now have more convenient options for requesting transcripts. They can easily upload their audio and video recordings from a local folder, via drag-and-drop, import their files through cloud storage services such as Dropbox and Google Drive, or paste an external link to an audio or video file to be transcribed – all accessible from their desktop computer and their mobile phone. After selecting their files, clients can choose their preferred turnaround from a drop down menu with the exact dates of delivery and the corresponding cost displayed. If a client has a specific project or compliance requirement, clients can upload supporting documents, add special instructions per file, and input a cost center for billing convenience. Clients can also opt for add-ons such as including timestamps, selecting verbatim options, and labelling of speakers. TranscriptionWing does not charge for special templates and has flexible terms of delivery where clients can indicate sending instructions per transcript for convenience as well as privacy. TranscriptionWing’s user-friendly website allows visitors to seamlessly navigate its services that are guaranteed to fit every transcription need. TranscriptionWing remains responsive to new and existing clients through phone, email, or its social media pages on Facebook and Twitter, where visitors can post inquiries, drop comments, and share their experiences with the service. For the latest news, promotions, and other information, please visit https://www.transcriptionwing.com. TranscriptionWing is a service of Civicom Inc., Civicom is a group of people working together to create value for others offering nine technology-facilitated services. For more information about TranscriptionWing, visit https://www.transcriptionwing.com.